We have a great treat for the weekend or even a birthday party! These cute cupcakes couldn’t be simpler (even if the “kid” is in her 30s). You can vary the flavours as you like, using different cake or flavoured ice cream. Place 12 paper cupcake liners onto your baking tray. Take the ice cream out of the freezer for 10 minutes to soften enough to make it easy to scoop. Using a knife, cut the pound cake into 6 slices, each about 3-4 inches thick. 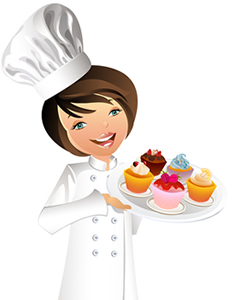 Using your cirle shaped cutter, cut 12 rounds from the cake slices (2 per slice) and put each one into a cupcake liner. Drop 1/2 teaspoon of strawberry jam onto each cake round. Using an ice cream scoop, scoop 12 balls of ice cream, dropping them into the cases as you scoop. The scoops should be large enough to peek out over the tops of the muffin cups. Then put the tray of cupcakes in the freezer to allow the ice cream to firm up again, at least 20 minutes or up to 2 hours. Using a large mixing bowl, add the cream and sugar and mix together with an electric mixer on medium speed until it gets very foamy then turn the mixer up to high speed and beat the cream until it forms firm peaks. Remove the cupcake tray from the freezer. Gently spoon the whipped cream into a large ziplock bag, remove any excess air, seal the bag, and squeeze the cream over to one side. Snip a small corner off the side of the bag where the cream is, and gently squeeze the bag to pipe the whipped cream on top of each cupcake to resemble frosting. Start around the outer edges and swirl up in the middle. To decorate, use sprinkles or fresh strawberrys, then place back in the freezer until the whipped cream firms up, usually takes about 45 minutes. 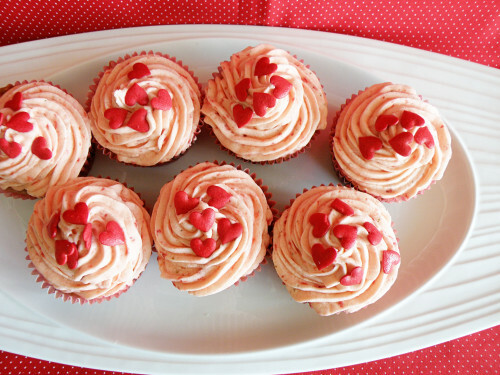 Remove the cupcakes from the freezer about 5 minutes before serving. Remember to send us a picture of your shortbread to our facebook page.